After jumping on a second mini bus to cross the border into Chile we met our transit guide, Miriam. Again, as from Peru to Bolivia, our guide was not allowed to cross with us and so Miriam took us across border control to our new hotel. This time we actually had to have our bags scanned and checked as the border isn’t classed as an open border. David actually got into trouble for smuggling peanuts…. Actually smuggling peanuts ha ha. Bryan also had trouble as his Diamox pills were in his outer pocket and apparently this looked dodgy. 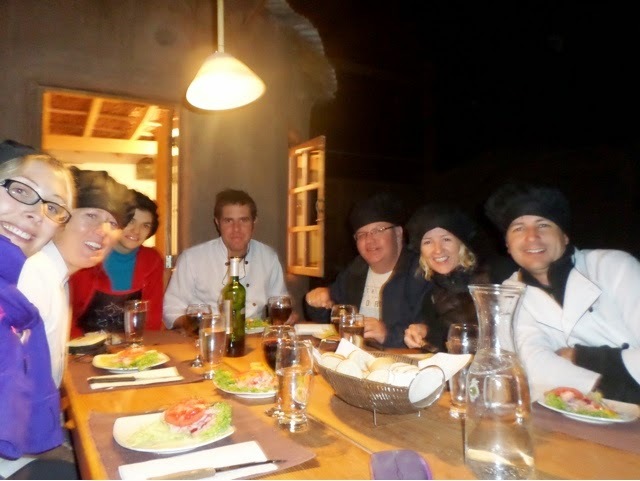 Safely at our lovely looking hotel in San Pedro de Atacama we met our new tour guide, this time we’ve got a girl too! Her name is Jjamilla and she is from Buenos Aires, she seems very energetic and upbeat which will be great as our last guide wasn’t the best. She will be our guide through into the next leg of the tour to Buenos Aires where we will change to our final guide who will take us to Rio. So were now in Chile, in country number four! The population of Chile is almost double that of Bolivia at 17.4 million. This leg of the tour ends in the capital city Santiago and I think Chile facts will be included in my Santiago posts later on as we are only passing through Chile for two days on our way into Argentina. 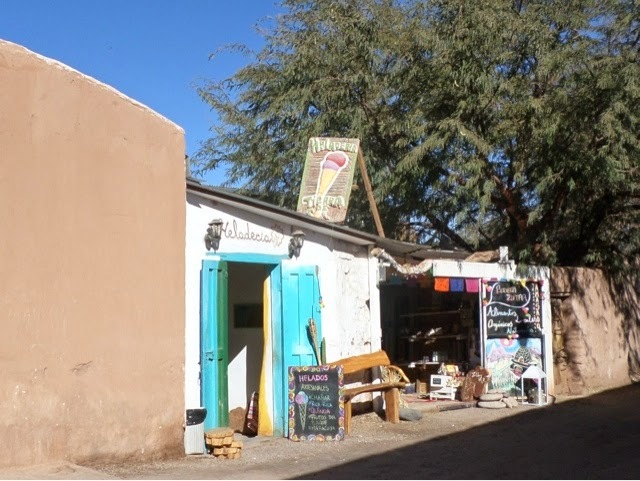 San Pedro de Atacama is a tiny tourist town, I think it’s essentially there as a stop off, as a border town for tourists to unwind after the salt flats. All the buildings are small adobe single storey buildings and they are all really pretty and nicely finished. The town further preserves the colonial mud street style, but they treat the dirt with a salt derivative called vichufita to reduce pollution. Essentially the town has one street with lots of tiny branches. The shops are all on the main street, Caracoles, which we stayed at one end of. It’s pedestrianized which is really nice and adds to the laid back feel of the town. 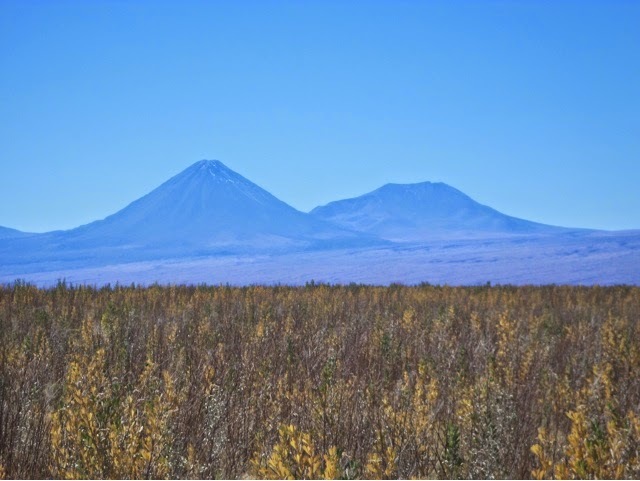 San Pedro is in the second region Chile and is actually the most arid desert in the world. It is also the archaeological capital of Chile, with ruins from the Atacama people. The town is named for its patron saint, San Pedro (St Peter) and the word Atacama is actually derived from an ancient Cunza word “Accatcha” which translates to mean ‘head of the country’. The town was invaded by both the Incas and Spaniards, becoming part of Chile in 1555. You can tell straight away how much more developed Chile is and how much wealthier people are. There are nice, new cars everywhere and the highway was fully surfaced. The people are also dressed in more expensive clothing and are taller and paler skinned with different bone structure, definitely more Spanish and less indigenous looking than in the previous countries that we have visited so far. The town is very expensive because it is entirely based on tourism, but there are lots of nice little shops selling crafts and pretty copper jewellery. We were all really tired from our super early start and after getting hold of some local currency (now pesos) we headed for lunch. We had the best lunch of the trip so far, Greek salads and then grilled salmon or quiche. I had the quiche with roasted vegetables and it was so tasty! We also had lemon tart win a teaser of the tiniest amount of meringue on top, but it was still tasty. The rest of the day was spent pottering about town. We tried to find a tandem bike to hire as we planned a cycling trip for the next day and two members of the group, Bryan and Jjamilla can’t ride. Amazingly we found one, but unfortunately it was broken and not available :-(. We then sat in the sun in a lovely little outdoor sitting area at our hostel and drank far too many Coronas. For dinner we had a local speciality Corn Pie, a pie that is layered cooked meat, creamed corn and cheese. It was great. We also had raspberry sours, but they were a bit sweet for my taste. Cute shops in the town, it is such a lovely looking town, I absolutely loved it. Our second day in town started with an awesome breakfast, which was very welcome after the last few days of stale bread roles. We even had pastries! They seem to have far better dairy products and even fresh sliced meats here, a welcome addition after the last few months. 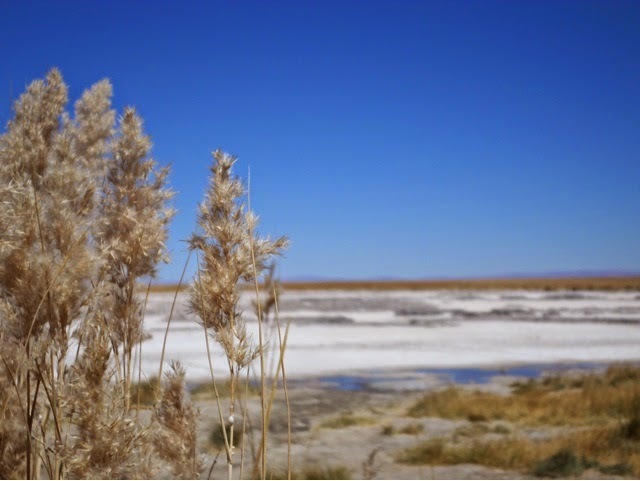 A group of us then hired bikes and cycled for about an hour out to a lake called Laguna Cejar, which is a very salty lake that you can float in. 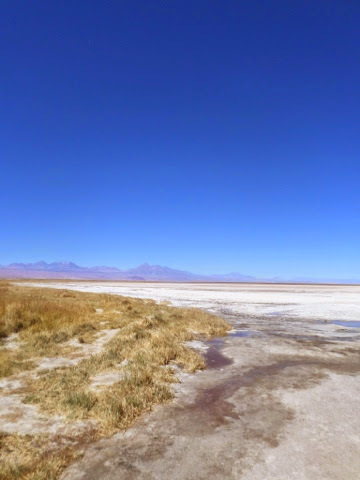 The ride out there was amazing as the road passes out into the Chilean salt flats and the Atacama desert and is lined on either side by a chain of volcanoes. Some of them have tiny amounts of snow behind them and you can also see how lots of small rivers have now eroded down into the lava flows down their flanks. It was quite spectacular and hard to focus on cycling on the dirt road because of the view. We reached the salt lake, there are actually three small lakes, but only one you can swim in. There were also a few flamingos hanging around too. The water in the lakes is really turquoise blue and the colours look amazing with the deep blue of the sky, the lighter blue of the water, the white of the salt and the red-brown of the surrounding volcanic hills. View across one of the lakes. We then went for a swim… Or rather float! The water was extremely cold and so it was a challenge to get into the water at first. Once I got in the sun was nice and warm on my skin and I warmed up fairly quickly. When you kicked around it got pretty cold quickly again though. It was also quite funny trying to swim as you’re just too buoyant. When you get out to dry you can see the white of the salt on your skin. Luckily they have showers by the lake to wash off and get changes. Otherwise it’d be a long salty cycle ride home. A tour group from a hotel had visited and was leaving as we were arriving. They were all wearing big fluffy white bathrobes and at first we thought this was really funny. But after the cold swim we were jealous and wanted robes too. We all sat in the sun and ate packed lunches with the best freshly baked bread I have eaten in the entire of South America… It’s looking like the food is going to be good in Chile! The ride back was rather hotter than on the way out and we didn’t have the same breeze either, so you really felt the heat of the sun. Although it was nice to be hot after being cold for the last week. 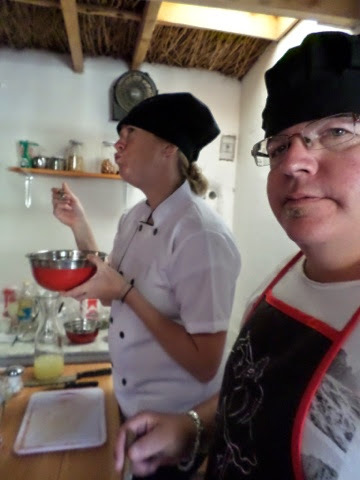 After a long shower to cool off and get rid of the last of the salt a few of us headed off to a local cooking class. 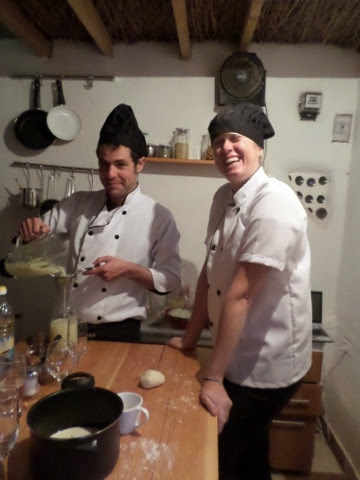 The class has only recently started running and is owned by the chef Rodrigo, who has a helper Ricardo. Bizarrely it turns out that Ricardo and his wife lived in the same suburbs in London that I did for almost ten years, so we knew a lot of the same places. It really is a small world! Michelle’s foot and she was wearing thongs! Omg! She was very lucky! 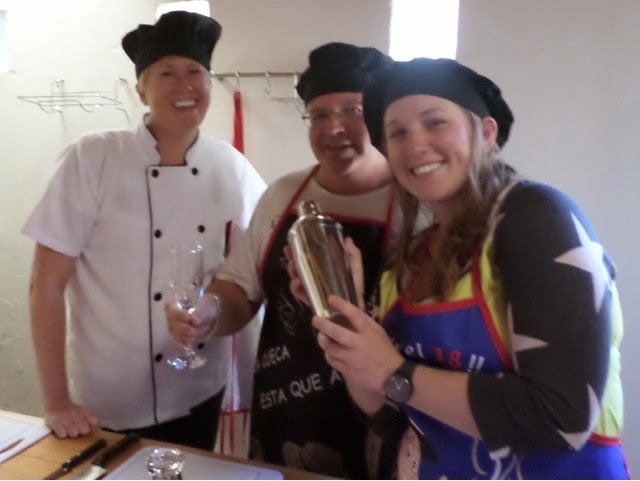 We then made a tomato salsa (pevere) which we ate with bread, I suspect to help counter the effects of the pisco! It was pretty much the same as having bruschetta. Then we prepared meat and vegetables which were fried off. Some of the meat is for empanadas. 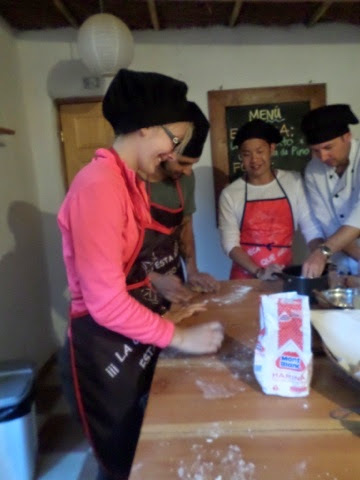 The empanada pastry is made using flour and water combined with milk, butter and oregano. 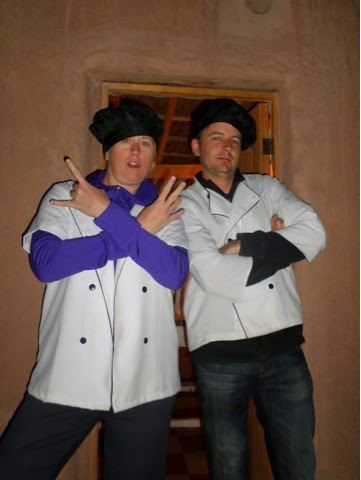 Posing with blunt implements only…. We rolled out the empanada pastry and then filled them with meat, olives and egg. People then decorated the tops so we knew who’s belonged to who. We then used the leftover meat to make smaller versions of corn pie, similar to the pie we had eaten in the restaurant the night before, but a more liquid version in ramekins. 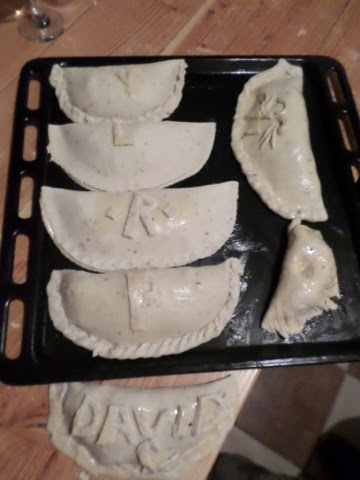 Our empanadas, can you guess which one is mine…? 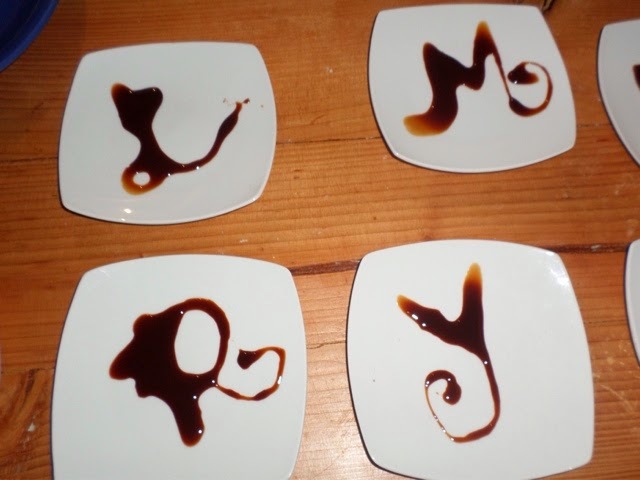 Courtney decorated the desert plates with everyone’s initials and they all looked very pretty. Enjoying the fruits of our labours and many many bottles of wine… Given that we had been drinking for five hours by this point I reckon everyone is looking pretty good! After we finished eating we headed to a local bar. The bars here are allowed to have live music but not licensed to allow for dancing, which seems slightly odd for a tourist town. Lindsey and I decided that we were going to dance anyway… Which was fine for a while. However the bar owners then told the band they had to slow the music down and play slow songs only to stop us dancing…. However this didn’t work out how they planned I don’t quite think, as it just resulted in slow dancing. The end of the night is distinctly blurry for everyone but we had a great time and it was quite a hilarious night that I can’t write about in too much detail here as it would just embarrass us all, ha ha! We all got to bed in the early hours of the morning, I think it was a miracle I managed to set an alarm at all! Packing the next day was frankly a miracle too! The following day we headed off early on a 12 hour bus to Salta, boo! This was not appreciated by any of us who had been out the night before and who were definitely feeling worse for wear. I know I was still drunk when I had breakfast as I happily stuffed a croissant with avocado, cheese and salami and got stuck into it, I then realised it was already filled with Dulce de Leche…. But wasn’t fazed and ate it anyway… Gross! 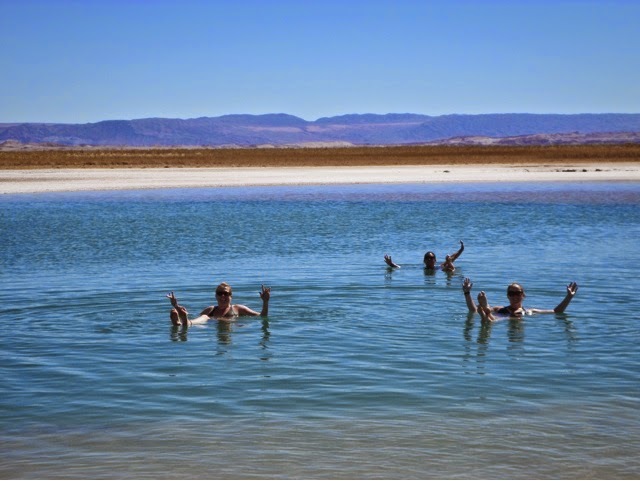 This entry was posted in Travel and tagged Atacama, Bike, Border, Chile, Cooking, Corn Pie, Cycling, Desert, Empanadas, Intrepid, Laguna Cejar, Pevere, Pisco, Salt pools, San Redro de Atacama, South America, SouthAmericanAdventure, Travel. Bookmark the permalink.